We’d love your help. 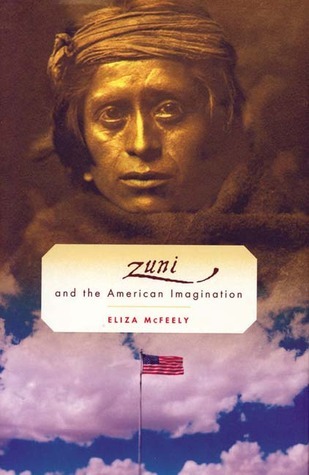 Let us know what’s wrong with this preview of The Zuni and the American Imagination by Eliza McFeely. The Zuni society existed for centuries before there was a United States, and it still exists in its New Mexico desert pueblo. In 1879, three anthropologists--Matilda Stevenson, Frank Hamilton Cushing, and Stewart Culin--came to study Zuni and, fearing it might be destroyed, to salvage what they could of its tangible culture. Though their methods are now disparaged and igno The Zuni society existed for centuries before there was a United States, and it still exists in its New Mexico desert pueblo. In 1879, three anthropologists--Matilda Stevenson, Frank Hamilton Cushing, and Stewart Culin--came to study Zuni and, fearing it might be destroyed, to salvage what they could of its tangible culture. Though their methods are now disparaged and ignored, their work vividly imprinted Zuni on the American imagination. The complex relationship between the Zuni as they were and are, and as they were imagined by these three remarkable, eccentric pioneers, is at the heart of Eliza McFeely's important book. Stevenson, Cushing, and Culin found professional and psychological satisfaction in submerging themselves in an alien world and in displaying Zuni artifacts in America's new museums and exhibit halls. McFeely puts their intellectual and personal adventures into perspective; she enlightens us about America, about the Zuni, and about how we understand each other. To ask other readers questions about The Zuni and the American Imagination, please sign up. If you were hoping to get comprehensive knowledge about the Zuni from the book like I was, you're probably better off looking elsewhere. You're probably better off reading the notes and references that McFeely lists at the end of the book if you want to know more about them. This book mainly focuses on the varying approaches taken by three key American early anthropologists. Each one has different approaches for their interactions and comprehensive knowledge of the tribe's culture, for better or If you were hoping to get comprehensive knowledge about the Zuni from the book like I was, you're probably better off looking elsewhere. You're probably better off reading the notes and references that McFeely lists at the end of the book if you want to know more about them. This book mainly focuses on the varying approaches taken by three key American early anthropologists. Each one has different approaches for their interactions and comprehensive knowledge of the tribe's culture, for better or worse. Perhaps it can't be helped that the Zuni end up objectified as a mysterious curiosity rather than an indigenous culture, but I felt like the book glazed over their exploitation too much for my liking. The heroic tone given to these three figures, in spite of their foul behavior, can be off-putting. I'll be fair in saying that it's because of their coverage that the future could create better practices and that the exploitation wasn't always one-sided. McFeely tries to balance that tricky line of also talking about a lost time for America, that curious age of exploration for colonists. I just don't think she sells it in a way that completely binds it with the Zuni as is initially pitched. Rather than capturing the curiosity of the entire nation, it feels more like the imagination of "the privileged" who could profit off of them. It mostly disregards how the locals and Spaniards felt about the Zuni too. An extremely well-written and concise compilation of the lives of three early anthropologists of Zuni, and whow their work led to America's fascination with a people. Engaging, concise, and a great synopsis of the time and the early characters of anthropology. Great read for historians and non-historians alike.